Merry Christmas Eve! Why yes, I do believe volume rotation integration is as easy as apple pie! Every once in a while something you learn in class really just knocks you off your feet. Those of you who have taken AP physics will know that position is the integral of velocity. About a month ago, on a fairly dreary Boston morning, I was sitting in my neurobiology class, semi-interested, when the professor informed us off something truly shocking: our brain determines and maintains our eye position by literally integrating velocity information into position information. It took humanity all the way until Newton and Leibnitz to figure out calculus, and it takes the education system about twelve years to teach calculus. All the while you are subconsciously integrating every second that you are awake. So while it is completely understandable that AP Calculus can be intimidating, it’s at least somewhat comforting to know that you—or at least your eyeballs—have been doing it your entire life! Unfortunately, as a math tutor near MIT, I’ve found that even for ambitious students, doing calculus is much more difficult. So here are 4 easy steps to remember when doing those pesky volume rotation integration problems. 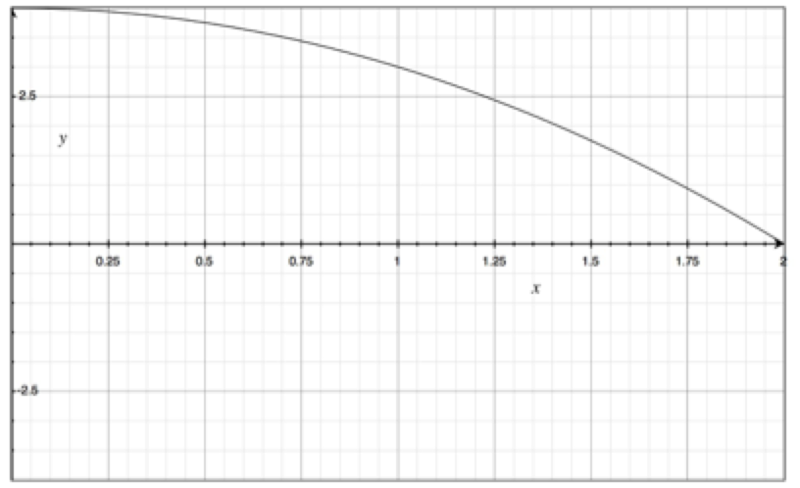 Find the volume of the shape created by rotating the curve y=-x2 + 4 around the x-axis for 0<x<2. As you can see, you are rotating the piece of the graph in the upper right hand quadrant. You can imagine, that by rotating around the x axis, you will make a sort of pointed cone-like figure on its side. Now let’s get to the math! Remember the concept of integration is to divide the shape into tiny cylinder-like slices that you will sum together. The height of the cylinder will either be “dx” or “dy”, and the face of the cylinder will be dependent on the slice. So you can either slice the shape horizontally or vertically. 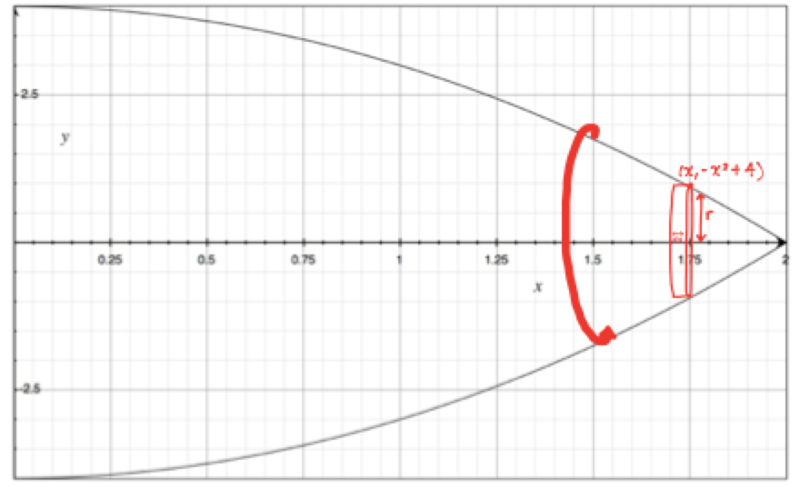 If you slice it horizontally you will end up with half-circles (ending on the y-axis), but if you slice it vertically you will have full circles, since you are rotating around the x-axis. The equation of a circle is pretty easy, so that seems like the better option. Also, imagine drawing a vertical line through the figure, it crosses the x-axis. This means that the height of each slice is “dx,” thus the variable we integrate will be “x.” This is convenient, since our equation is in terms of x. In general the volume of a cylinder is: (Surface area of the circle)*(height). The height is dx. The surface area of a circle is pr2, making the volume of each slice: pr2dx. It is easy to see that the only thing we need to figure out now is r.
The radius of a circle is the distance from the center to the boundary. Since we’re rotating around the x-axis, we know the x-axis is our center. The boundary is determined by y-coordinate on our curve. So the radius of each circle is going to be y-0 or just y. Now your integral is a simply polynomial that you can integrate using rules you’ve already learned. While integrals can be intimidating at first, remember the key is to 1) find the easiest shape, 2) to remember the equation, and then 3) to find the appropriate coordinates to substitute into your equation. If you remember these basic steps, you will soon love calculus as much as these fellas. For more inspired reading, check out this blog post on following your math intuition, and translating words into equations, written by an MIT math tutor. For more help with calculus or any other advanced math tutoring needs, consider working with a Cambridge Coaching’s MIT math tutors in Boston, New York, or online.